Almost one month to the date, I’m coming up for air and blogging again. Many of you know I’ve just made a monumental decision to a) leave my job in central Illinois, b) move to Baltimore, MD and c) start a new job. This is no small feat. 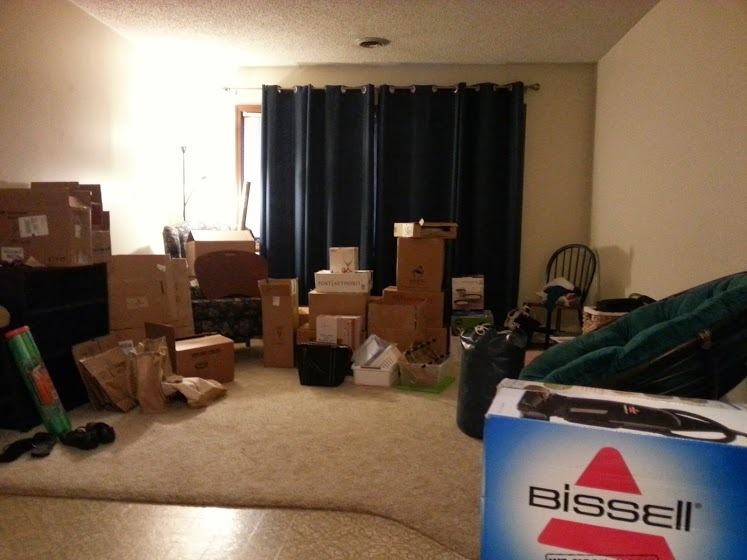 Four insane weeks of work, goodbye meals and the constant rip and tear of packing tape in my cardboard kingdom. Thank goodness for friends who will work for carrot cake, because that’s how I paid my friend John to help me fill in the Ubox. For anyone who is considering moving in the future, I will go ahead and give a shameless promotion here: Uhaul Ubox is affordable and fits a whole damn lot. My entire 1BR is nestled in one right now. Remains to be seen when I will actually receive it, but that’s another story. I have enough in my car to live on until it arrives. And suddenly, I’m in Maryland. 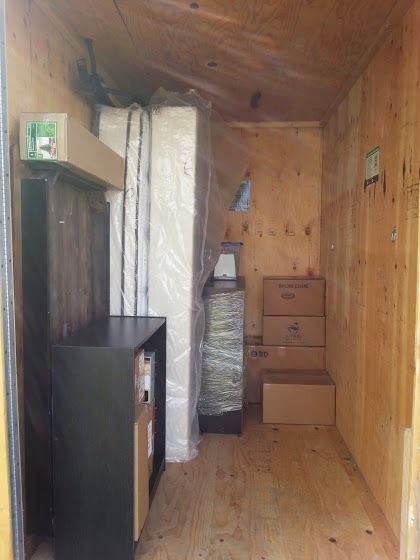 I tossed it all into a Uhaul Ubox (aka POD) on Saturday, drove 7 hours to Pittsburgh last Sunday, then 4 hours into Baltimore on Monday and started seeing apartments immediately. I saw six apartments both in and outside of the city and made my decision pretty quickly. I ended up with a gorgeous place 2 miles from work and 10 miles from the city, no parking drama, no commute and an absolute mecca of activity compared to my former digs. The stopover in Pittsburgh was a delight, as I got to rendezvous with a high school friend who I’ve not seen in some time. We dined at BRGR where I got so full so fast that I barely had room for the truffle cheese whiz dip for the fries (really). The pumpkin spiked milkshake won the day, without question. I also forgot how palatial rest stops are in the East. While in the Midwest I spent a lot of time hopping on / off exits to a) take a pee break, b) gas up the car, c) get some food. Now here, I can do all three. My students, friends & faculty also made sure I had Starbucks cash to spare, so I managed to caffeinate accordingly. The roads were clear, the skies were blue and the leaves were all changing colors – it was the perfect road trip. Now I’m blinking in the sunlight of civilization and can’t stop smiling. Hello, world — I’ve missed you! I’ve packed the Pontiac within an inch of it’s life, and there is just enough room for my travel companion and her duffel bag. If one of us sneezes, there may be complications. Packing for a road trip / life change is wildly different than packing for a year overseas. For one thing, I have zero baggage restrictions. This is both glorious and dangerous at the same time. On one hand, I can pack as much as possible – every girl’s dream, right? Wrong. Danger! Do you know how much stuff I own? A significant amount. On the other hand, and only slightly different, I can pack without restrictions. Think: 12 oz of contact solution instead of 3 oz. That’s a big deal when you’re schlepping long term, long distance and therefore .. glorious. I’m not moving any furniture, and I’m not getting on a plane. Both of these are money savers. 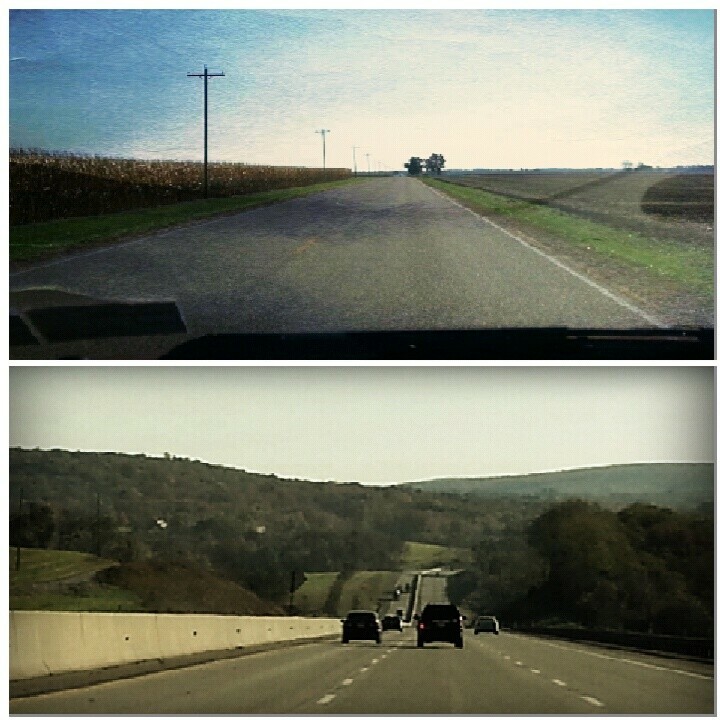 I am driving across the great state of Pennsylvania and into the Midwest, in my own car. This is also a big deal – my life would have changed dramatically if I had a car last year. Admittedly, it would have increased my fear of driving, parking, traffic and cyclists in the country .. but that’s part of the vehicle owning package en España. Come what may, I’m headed west. But not before one last volleyball match. Charleston, I hope you have a rec league with my name on it. Stay tuned for laughs from the road .. 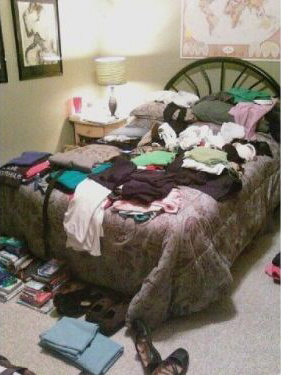 Here it is again .. my suitcase, standing tall and empty in the spare room. Soon it will be suitcases, plural. After all when you leave the country to set up shop somewhere else for a long period of time, I would argue you need at least two suitcases. Suitcases are not my style; I like to travel light – especially over long distances that involve flight time. Apologies to airlines everywhere, but I don’t trust you with my stuff and I have no intentions of paying through the nose for you to manhandle my baggage. I will carry-on my luggage 99% of the time, to avoid the hassle of baggage claim and the frightening fees associated with checking a bag. Nowadays even carrying on has become something of an Olympic sport, with low cost airlines like Ryan Air and Easy Jet challenging travelers to stuff their bag into one container or another or pay the price. So what? I’m going to Rome for the weekend, I don’t need much more than a toothbrush and a camera. Not so, as I pack for another year in Spain. This time – nine months, and a bit more than a toothbrush and a camera. I laughed out loud when my friend and fellow auxiliar Natalie wrote to me and said: “call me crazy, but I’m going to bring less clothes and more peanut-butter-pretzels this time around…” She’s not crazy. She’s moving to a mountain town with a population of 7,000 that is 90 kilometers from Seville. They probably don’t have a Wholefoods and damn sure no Trader Joe’s. Last year in Seville I pined for the funniest things: Quaker oatmeal, vanilla extract, Claussen pickles, Grape Nuts and Burt’s Bees products. This year I’m off to Madrid, a larger and more cosmopolitan city that probably stocks a full line of peanut butter (which I did not have while living in Granada) and at least three familiar name brand cereals. Does this qualify as exporting the expat? Can we go native without our creature comforts? Probably. But I will still dance around the kitchen when the Thanksgiving box arrives with McCormick gravy mix, or the Easter Peeps appear. So what have I learned? If you’re going to a big European city, you can leave a lot at home. You’re going to want your favorite hoodie more so than that family size bottle of lotion. Lighten the load! They may not have your favorite brand of shampoo, but they do carry hygiene products in our fellow first-world countries. Yes, if you’re picky about face wash or deodorant, you might want to stash that in your bag. But rest assured there will be toothpaste, q-tips, and razor blades at your destination. Save room for your pretzels. What do you have to pack that you can’t live without? Fellow Hispanophile and Sevilla resident Kim of Becoming Sevillana nominated me to take part in the My 7 Links project from Tripbase that has been sweeping the blogging community. Kudos to the Tripbase group for such an awesome idea! Thanks to this phenomenon I’ve had the chance to read some excellent excerpts from some of my favorite bloggers, highlighting everything from the most beautiful to the most controversial. As for me, it’s an unexpected way to unearth some old posts and see what I’ve been sounding off about since May 2009. 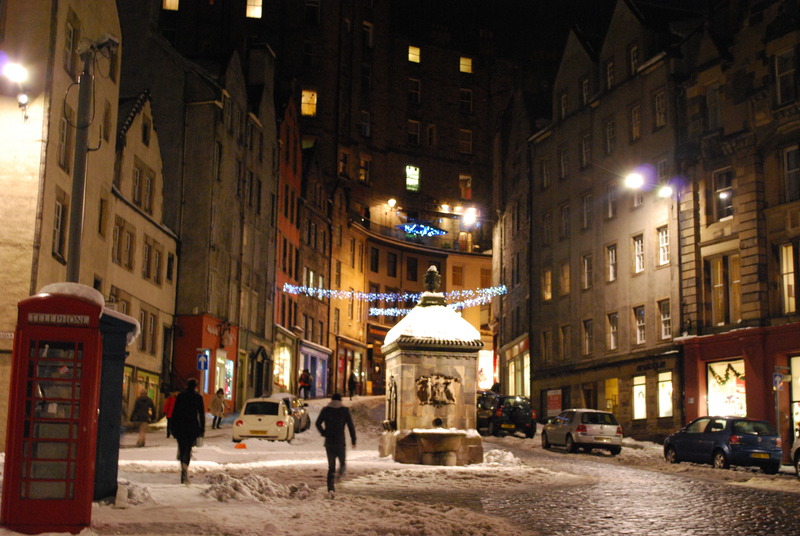 This was my first CouchSurfing endeavor, and also my first time in Scotland. At the time I was jonesing really hard for some old -fashioned Christmas and Spain was just not doing the trick. There was no snow. There were no decorations. And where the hell is the eggnog? When my friend Brett and I chose to go to Scotland for a quick weekend, we were taking advantage of a cheap flight and a free couch. We were rewarded with crisp, clean air and a snow-covered holiday paradise. It was exactly what the doctor ordered. It was beautiful. Written in October 2010 this post is all about my battle with Spanish bureaucracy and an attractive immigration officer who takes pity on me. I spent a day and a half completing the application process required for my NIE (numero de identificación). It’s not every day you can write about a tall, dark & handsome man who buys you ice cream when the internet goes bust. I will never forget this one! Although I can’t take credit for this visual recreation, this YouTube video does a great job showcasing the red-tape scenario in Spain. As an American expat on Spanish soil, I was in the wrong place to declare that I don’t give a fig about fútbol. That is to say, soccer. I will watch a 14-inning baseball game (if my team is playing). I will coach loudly from the couch during March Madness. I will play volleyball until I collapse on the gym floor. But soccer? I’m busy. This? Este es controversia. Truth be told, I needed to write this post. I had just come home from a year abroad in Europe and all things familiar were feeling foreign and confusing. When your native language doesn’t slip off your tongue like it should and your house may not in fact be your true home, it can be a startling experience. Turns out a lot of you have felt the same way when returning from various ports of call. What a great response.. thank you. This is about how studying abroad rocked my world. Rocked my world so thoroughly that I switched gears from international business to international education and plowed full speed ahead into a graduate program, a travel agenda and a lifelong pursuit of education outside of the comfort zone. It also talks about how I made the move ALONE – a big deal for a 20 year old American female. As SoloTraveler can tell you, it can be one of the most profound experiences of your life. This post did not break any records or blaze any trails. It is probably not my best writing or even my most creative. So what gives? I’m proud of this project, and the post is just a by-product. This past school year I worked with a friend in Pennsylvania to match up approx 250 high school students to launch a Transatlantic pen pal project. 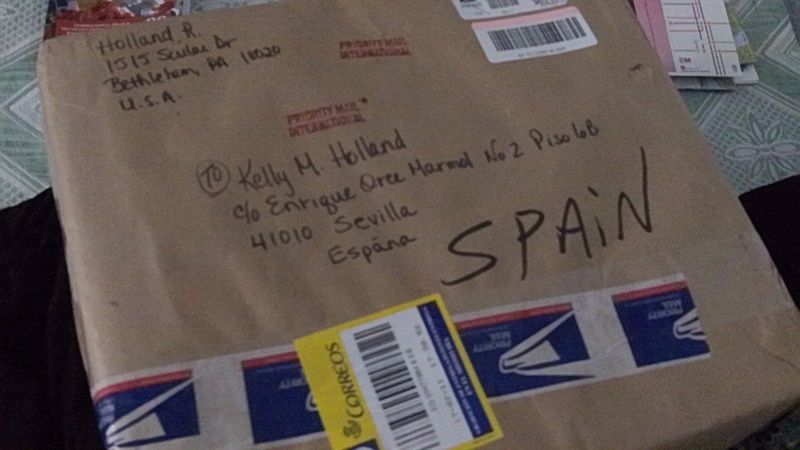 This post is about my Spanish students’ first reactions to receiving mail from their American pen pals. Our practiced their second language on pen and paper, writing hard copy letters to their overseas pen pals. Jess and I recently sat down over tapas and compared notes on the experience. Our students gained so much from the project, and forged friendships over distance and time. This, to me, is incredible. Thank you, Jess – desde mis alumnos y yo! I had an epiphany late last night and I actually had to sit up and write it down in case I forgot its awesomeness.. One big suitcase at 50lbs, one small to carry on, fold backpack, carry purse. The suitcase in my mind is a vastly different species than the one I’m actually using. The one in my head has incredible space – a black hole of canvas and zippers, endless gaps and hidden pockets where I can fit my entire life. However the suitcase I’m using has a slightly more limited capacity. I’m satisfied with my move to one big, one small to carry-on and a purse (read: large shoulder bag). I’ve utilized the space far more efficiently than in my previous packs — a plug here for Space Saver bags. In that itty bitty suitcase, I’ve managed to relocate all of my shirts with the exception of dress clothes and all pants except jeans. There is an outside chance I may wear the same outfit for a week while at the hotel simply because I have zero desire to go through this again. (heading to BBB for additional space saver bags). Ok so my idea wasn’t as epic as I had hoped. I’m tired and frustrated and ready to throw things. The big suitcase is super unwieldly and I can’t figure out how to take the “spine” out of my backpack. I’m squishing the entire lot into the space saver bags, come hell or high water. Drive to my moms office and weigh the bag. It’s 12lbs overweight… our bathroom scale was way off! At the airport that could equate to a $200 overweight bag charge. Instead I am now opting to check two bags. The first one is free, the second will be $50, which sounds a lot better than risking an overweight bag fee. Oh the joy of air travel. I’m packed. 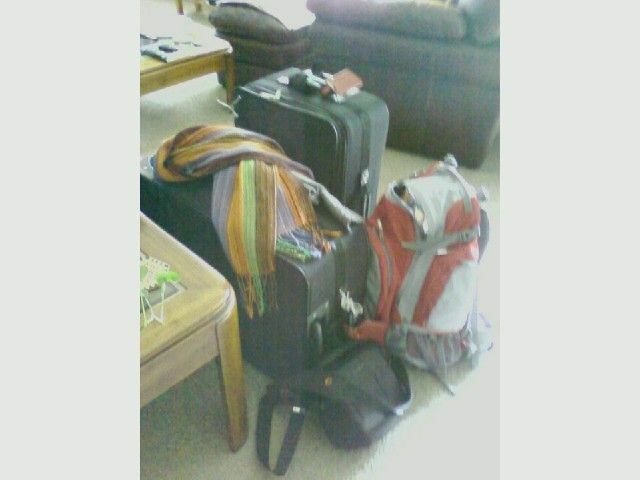 Approx 75 lbs of luggage in two suitcases, and a backpack on my back. At this point I’m tired of looking at all of it and can’t wait to throw it on the conveyor belt and not see it for a few hours. 4 pm will start my trek to the Newark airport…. next time I post I will hopefully be happily ensconced in the hotel in Huelva.